Joelle Chase interviews Diana Butler Bass, Christian historian and author of numerous books, including Christianity After Religion: The End of Church and the Birth of a New Spiritual Awakening and A People’s History of Christianity: The Other Side of the Story. Joelle Chase: We are exploring in this issue of ONEING* the Perennial Tradition, the truth that continuously recurs within the world’s sacred paths, pointing to Divine Reality in all things and the goal of existence as union with that reality. From your own background, now as an Episcopalian, previously as an Evangelical, and as a historian who studies Christianity, how would you define tradition? Diana Butler Bass: Much of my work centers around ideas of tradition, what tradition is and what tradition isn’t. I often refer to a definition of tradition that was developed by the great 20thcentury church historian, Jaroslov Pelikan, a Lutheran who eventually converted to Orthodoxy. Pelikan said that tradition is the living faith of the dead, and traditionalism is the dead faith of the living. I love this, because I think the essence of Divine Reality means we’re all connected, and it makes sense to think about tradition as this living thing we inherit from people who have gone on before us—their experiences, the poetry, words, art and beauty that matter to them, the insights that they learned from their own lives. It becomes problematic when we freeze-frame the things they’ve passed on to us and we act as if tradition wasn’t a lived experience, but instead some sort of unchangeable, antiquated vase that we don’t like. Then tradition passes over to traditionalism. Many people think they’re adhering to tradition when actually they have just become traditionalists. Instead of living it, they have ritualized the experience of their predecessors, losing the essential connection with spirit that animated the original experience. For the last decade I have been thinking, writing, and talking much about living and experiencing tradition and how we connect with our ancient faith, letting it sing in our own lives. Joelle: You’ve said in your book, A People’s History of Christianity, that tradition is important to keeping the faith strong and alive and whole, that there is danger in losing our roots, the history of our faith. And yet, as you just shared, we don’t want to freeze-frame our faith or let it become stagnant. How can we find the balance to claim and embrace our tradition while being inclusive, open, and fluid? Diana: Only recently has our culture begun to welcome, with the rise of postmodernism, a connection with our past. During the 17ththrough early 19thcenturies there was a large-scale philosophical rejection of tradition in favor of whatever was modern or innovative. But now we have a new opportunity to claim our past. For me this raises the question, "What part of the past do you claim?" In this sense, tradition becomes something that we’re always having a conflict about. Does the tradition include, say, Hildegard of Bingen? For many years the tradition didn’t include Hildegard. She was too controversial. People had forgotten about her. There wasn’t a place for a woman who was a doctor and a theologian and a lay preacher, so the church let the memory of Hildegard of Bingen lay waste. It’s only been in the last 30 or 40 years, as we’ve gone back into history and asked the question again—What counts?—that she’s been recovered. Tradition is much more flexible than we often think it is, and whenever we talk about tradition it inevitably involves conflict—whose tradition matters and who gets to say which tradition matters. I like to call this a lively argument for the entire history of the church, and the church is richer for it! The post-modern movement has opened our eyes to that broadness of the past and how we might re‑appropriate it. Joelle: What counts for you when you’re looking back through the church’s past and claiming pieces for yourself? Diana: That’s the big question! When I wrote the book A People’s History of Christianity that was one of the things I had to try to figure out. What would really count as a history that people who read my book would find meaningful? In the 21st century people are not very interested in the history of institutions—of denominations and organized church, popes and buildings and theologians and “great men”—which has been the primary focus of Christian history. Those things are beautiful and they’re part of that big wide swath of Christian experience, but we have generally only told those stories. So I ask myself where people’s interests are now, where do we find God, how do we connect with God? I think we often find God in each other, so I search history for simple people, people like me, who loved God. I make friends with the most common people and find God in their stories. Joelle: In A People’s History of Christianity you juxtapose the Great Commandment—to love your neighbor as yourself and to love God—and the Great Commission—the words attributed to Jesus, “Go and make disciples of all nations.” You say these two commands affect our perspective in dramatically different ways. Would you talk about how these “Greats” influence history and our own lived spirituality? Diana: I think it’s fascinating that Protestants in particular love the Great Commission. Historical, critical scholars over the last century have studied this passage at the end of the Gospel of Matthew in depth and, I think, rather successfully shown that it was a later addition to the gospel. “Go and baptize all nations” are probably not words that Jesus spoke, but were added quite a bit later. Yet here we have whole traditions that have taken those words and made them the central point of the gospel—to evangelize the whole earth. The contra-command—the command to love God and to love your neighbor as yourself—scholars believe Jesus actually said. So those words, as far as we are aware, are completely genuine to Jesus’ teaching and are at its center. “Love God and love your neighbor as yourself” is really the theological turning point of all four gospels and certainly the letters of Paul. This framework of love should be at the middle of all of our understanding of what the church is and what evangelism is, the point from which everything else spins out. If you have a Great Commission without the Great Command, if you just go out and evangelize people and you aren’t paying attention to loving God and loving neighbor as yourself, you are always going to wind up in a bad place. The Great Commission without the Great Command is intolerance, militarism and crusades. The Great Command to love God and love your neighbor, without the Great Commission, on the other hand, can wind up being kind of self-centered, but at least it’s a loving isolated reality. What if we take the command to love, and we understand it as our commission? What does that look like? The doing of social justice, serving the poor, really listening to and being friends with people in other religions. That’s what I dream for the 21st century—a church that can re‑center itself in love and yet not simply say we feel loving and that’s good enough, but to take that love and to reinterpret the Great Commission, not as a triumphal spread of Christianity but as the humble spread of God’s dream for justice and harmony here and now. Joelle: You’ve mentioned Hildegard von Bingen, who had some beautiful ideas and images on cosmic unity. We can follow the thread of unity throughout Christian history, though it seems to be emerging even more strongly today. How do you see the truth of union—Divine Reality undergirding all things—fitting into Christian tradition and faith? Diana: When I think of Hildegard I think of circles, mandalas, a symphony, people dancing or moving together in a fluid way. For Hildegard connection was organic, not about straight lines. When I think about this through the lens of mainstream Christian tradition I tend to think about the cross, two lines perpendicular to one another. We have emphasized the cross as the central symbol of Christianity and not the circle, which has created an unbalanced understanding of the story. I think Jesus and his followers spent more time in circles—sitting around a campfire or dancing at a wedding—during their time together when they were journeying through ancient Israel than they actually spent contemplating this instrument of torture, the cross. 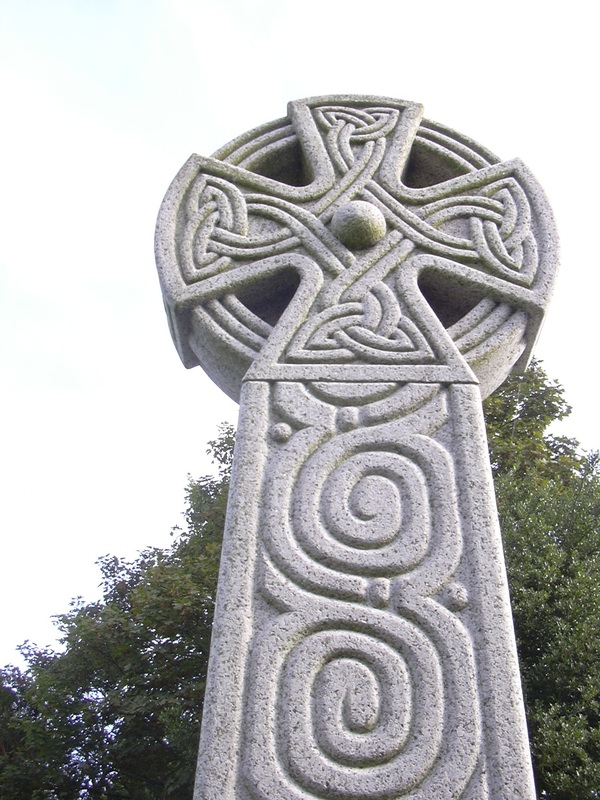 I love the Celtic cross because it combines the lines and the angularity of the Christian cross with the circle, reminding us that an organic unity is central to Christianity, and somehow it’s both of those things. I like thinking about alternative symbols for Christianity; we can get so stuck on the two or three expected images, stories, or interpretations that our imagining of what it means to be a person living in and through God is limited. Anything that challenges the narrow vision of Christian tradition is a benefit for my spiritual life and, I think, for the life of the church. Of all the things that we need in the 21st century, I think imagination is at the top of the list. Joelle: You seem hopeful for Christianity’s future. Could you give a few examples of things that make you most hopeful, that indicate the Christian faith is headed toward more love, more union? Diana: This will probably sound strange, but one of the things that I find most hopeful right now is that so many people are angry at the church. Catholics are angry at the Catholic Church; Protestants are angry at all different kinds of Protestant churches. I have Orthodox and fundamentalist friends who are angry at their churches. I know more people who are angry at their churches than I know who are happy with their churches. You can think of it as a terrible thing and that we should despair. But it really is a sign of hope. If people were content with business-as-usual-church, what kind of hope would that be? It would just mean that people were happy with a kind of conventional, religious pablum. Many churches are not offering a robust vision of what it really means to live a radical life of the beauty of God through Jesus Christ. People are discontented with churches that are just offering them the same old answers or the same old liturgy. To me, that’s the greatest sense of hope there can possibly be, because people are hungry for more. Being angry at the church, throughout the whole history of Christianity in the last 2,000 years, has always been the seed bed of spiritual renewal, reformation or new movements. St. Augustine said, “Hope has two beautiful daughters: Anger and Courage. Anger at the way things are. Courage to ensure they don’t stay that way.” So if discontent is the beginning, hey, we must be at the beginning of something amazing. Everybody’s angry. That’s my greatest sense of hope. Joelle: What do you think that something amazing is going to be? Diana: I think it has something to do though with this combining of things that we’ve been talking about, that somehow it’s going to be a reinterpretation of the whole tradition on the basis of “love God and love your neighbor.” I think there will be a combining of the circles of Hildegard of Bingen with the angularity of the traditional symbol of the cross. And it will come from listening to the voices on the fringes, helping us reinterpret and re-imagine our faith. *This interview appears in the Spring 2013 issue of Oneing: An Alternative Orthodoxy, a publication of the Rohr Institute, available at cac.org.